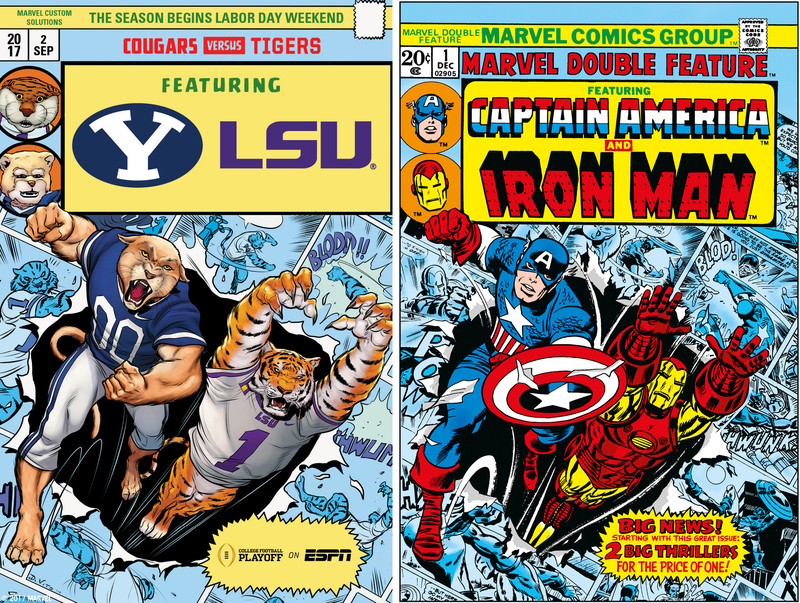 For the fourth season in a row, ESPN and Marvel Comics have teamed up to make custom college football comic book covers ahead of the 2017 season. 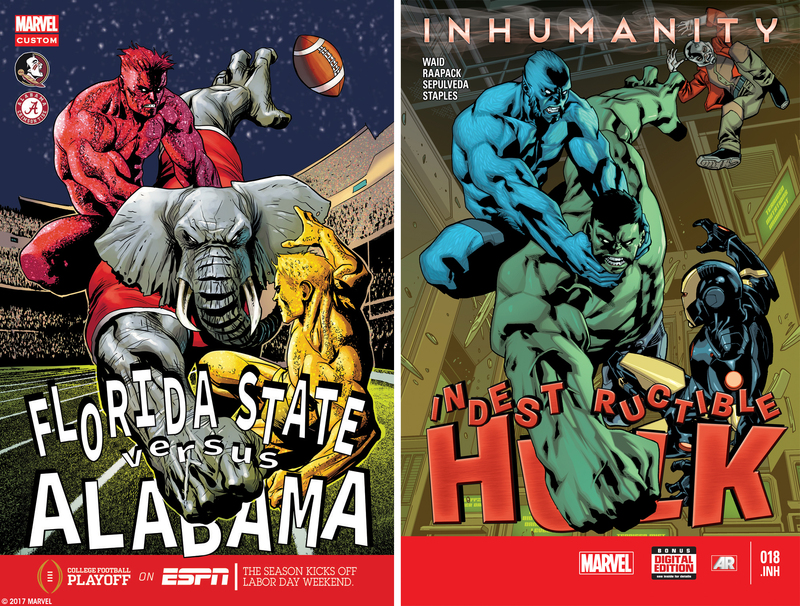 For kickoff weekend, which begins Aug. 31 and runs through Sept. 4 on ESPN/ABC, Marvel Comics has created six “Kickoff Covers” with six of the biggest games of the weekend, including a matchup of two national champions of the past four years, Florida State and Alabama. 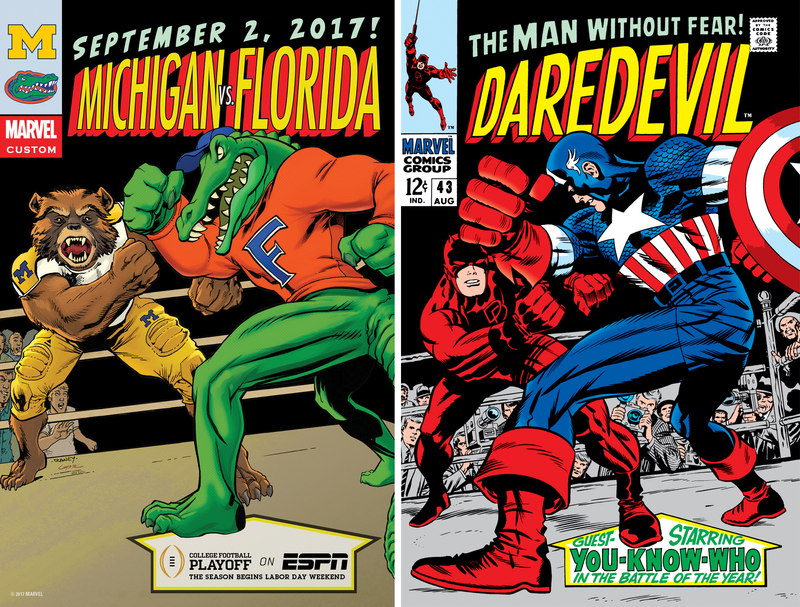 The Undefeated took each cover and explored how Marvel comics, some from as early as the 1960s, can help explain these present-day powerhouse matchups. This reprint of December 1966’s Tales of Suspense Vol. 1 #84 essentially tells the shrapnel-in-chest story from 2008’s Iron Man movie. While fragments of metal aren’t slowly sinking into his heart, LSU Tigers All-SEC linebacker Arden Key is not expected to play because of an offseason shoulder surgery. But LSU should fare well against a BYU squad with a second-year coach, a slew of new running backs and receivers, and its fifth quarterback change since 2012. Avengers members Iron Man, Giant-Man and Beast attempt to stop The Hulk/Bruce Banner from detonating a bomb that will destroy a cloud that attacks superhero DNA. College football’s Hulk, Alabama’s Crimson Tide, have won half of the NCAA titles since 2008 and have their own hulking, muscular giant in the form of running back Bo Scarbrough. It will take a heroic effort from a Seminoles defense, anchored by Jim Thorpe Award preseason nominee Derwin James, that averaged just 11 points allowed over the last three games of the 2016 regular season to slow down Scarbrough and true sophomore quarterback Jalen Hurts. This issue, titled Nova Against the Mighty Thor, sees our hammer-wielding hero turn evil by the sweat glands of a white-haired villain named the Corruptor, which causes him to fight friend Richard Rider, aka Nova. Like Thor, Tennessee has been unrecognizable the past two years, with back-to-back nine-win campaigns, something the Volunteers haven’t mustered since the 2006 and 2007 seasons. 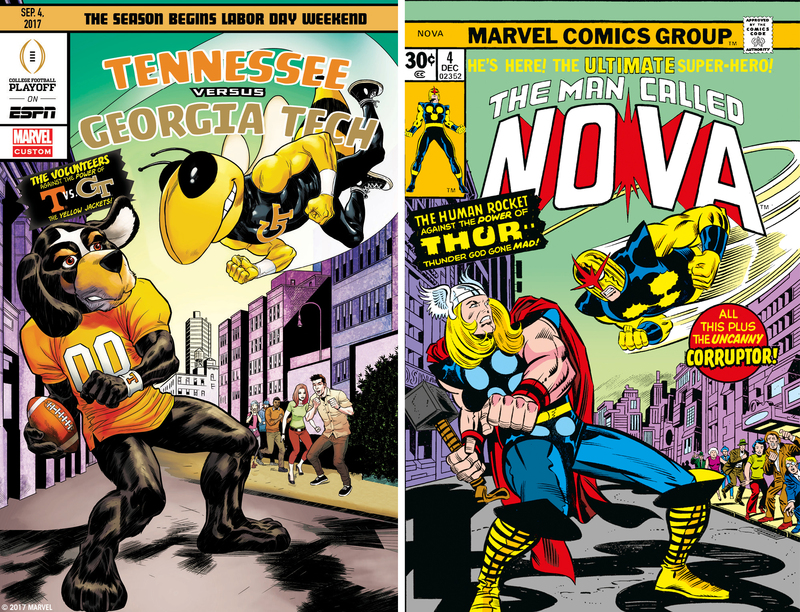 Three years removed from an ACC divisional title, the Yellow Jackets, like a neutered Doc Ock, bring their dreaded triple option to the new Mercedes-Benz Stadium in Atlanta. Georgia Tech hasn’t averaged fewer than 250 rushing yards a game since 2007. In World War Hulk, Banner is blasted into space by the Illuminati posing as S.H.I.E.L.D. leader Nick Fury, and upon his return to earth he battles Avengers members Iron Man and Hercules. After being embarrassed by eventual champion Clemson in the College Football Playoff semifinal last season, Ohio State returns 15 starters, including Quicksilver-like fourth-year quarterback J.T. Barrett. The Indiana Hoosiers are by no means a formidable opponent — they have not had a winning season since 2007 and have not won a bowl game since 1991 — but Indiana’s stingy defense shut down the Buckeyes’ passing attack last season (93 yards). While hosting a charity fight at Madison Square Garden, Captain America is attacked by a radium-exposed Daredevil, and the pair grapple until the chemical wears off. Michigan coach Jim Harbaugh is willing to pick a fight with anyone in college football, but just as he has turned around the Wolverines program since 2015, Jim McElwain has done the same in Gainesville, taking the Gators to back-to-back SEC championships. Michigan owns the all-time series (3-0), including a 41-7 beatdown in the 2016 Citrus Bowl. Members of the Avengers (Captain America, Iron Man, Black Panther, etc.) and Defenders (Doctor Strange, Silver Surfer, Hawkeye, etc.) descend on Los Angeles to prevent a fight between Thor and The Hulk, who are battling over the final piece of a catastrophic weapon. This Appalachia rivalry has lasted more than 100 years, with the first meeting in 1912 (Hokies won 41-0). 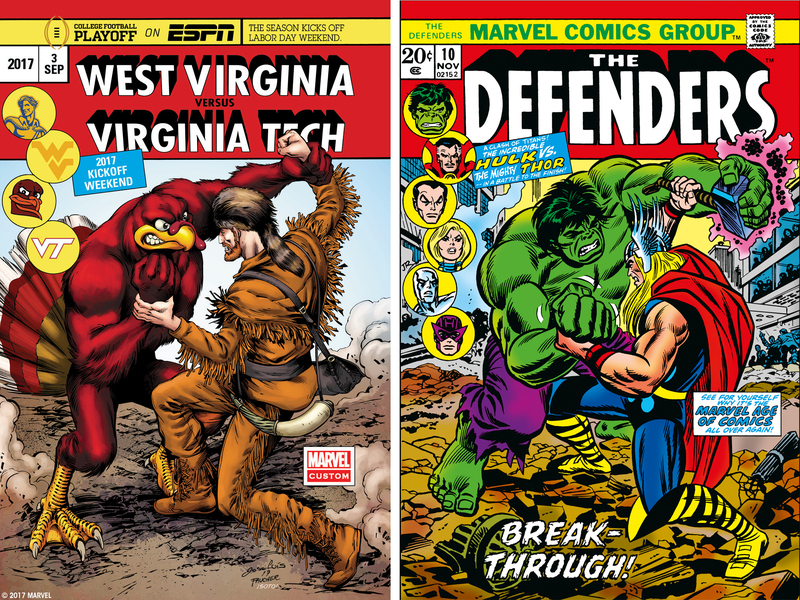 Like the difference between cinema and television, the series has tipped in favor of West Virginia, which holds a 28-22-1 advantage. 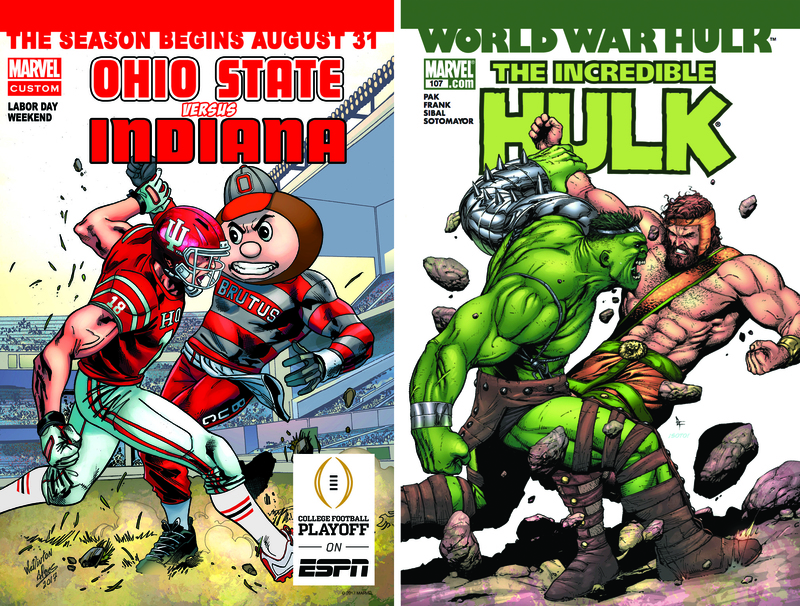 With questionable offenses for both teams, and back-to-back Top 25 rankings, this matchup should not be the rout a Marvel Cinematic Universe vs. Netflix universe would be. FANDOM’s Marvel Database was the primary source for this article.